Last month a week before the school holidays started, we received some devastating news. One of my son’s reception classmates had been involved in a freak accident which had left him badly burned and facing a lengthy hospital stay. His father who stepped in to help him was also badly injured. As soon as news spread in the local community people wanted to help. Fundraising begun immediately to try and help the family in a practical way with the costs of travelling to and from the hospital, but the parents of reception class also felt they wanted to do something to show our support. 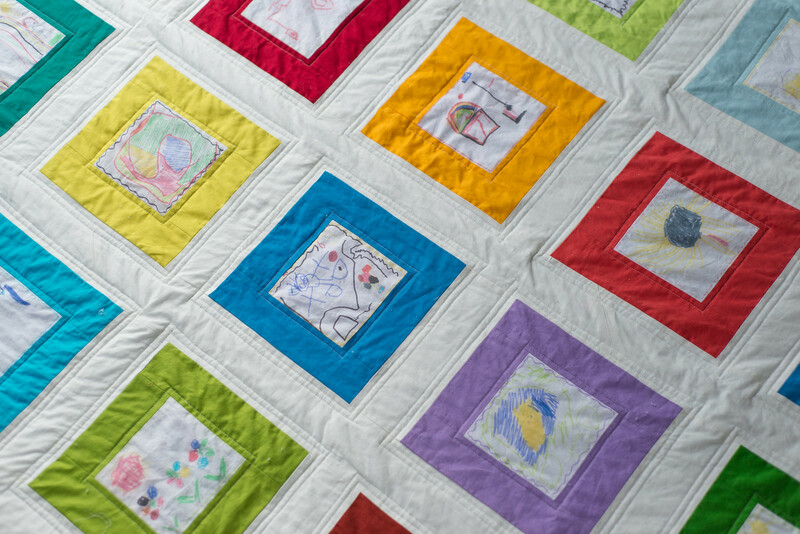 In America quilts are frequently given to patients in hospitals to provide comfort and I’m a firm believer that they absorb the love and positivity of the people that create them. 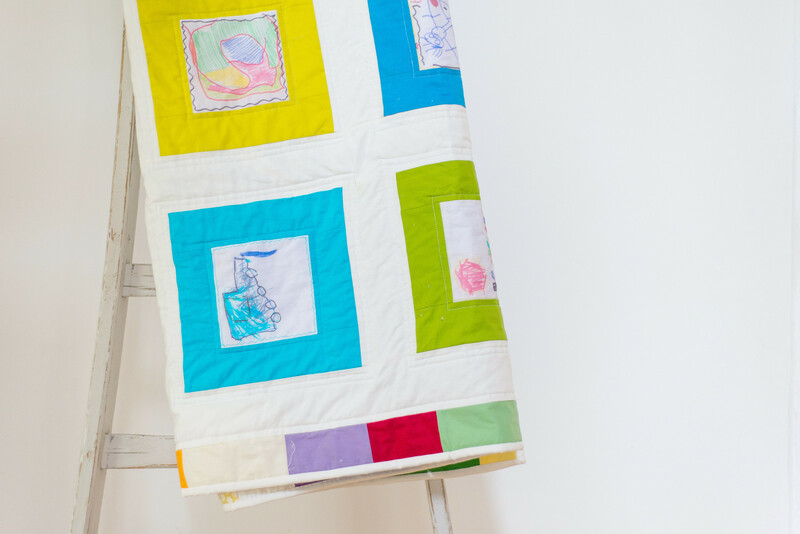 Being wrapped in a quilt is about so much more than being wrapped in fabric, it’s the closest you can get to being hugged, so it made sense that we tried to create something that might offer this little boy a bit of comfort. 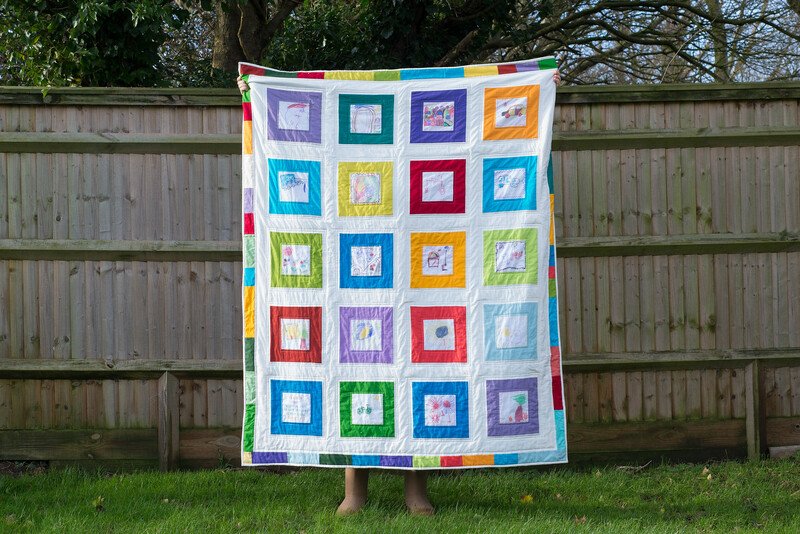 Several years ago I saw a quilt made out of children’s artwork and it seemed liked the perfect idea for this boy. 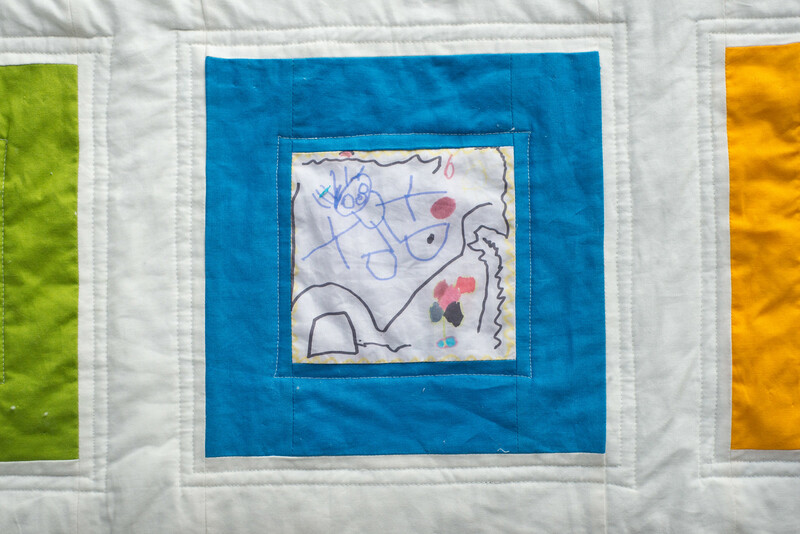 His nineteen classmates each drew a picture which was printed directly on to Blumenthal Craft cotton poplin specifically designed for the purpose and gifted to the project by Geoff at Cotton Patch in Birmingham. Each picture was bordered with Kona solids and then sashing was added in Kona Snow (A good chance for me and my sister to have a destash!) The final border was made up with the bits and pieces we had left over and the binding was more Kona snow. Over Christmas mums and kids dropped in to my little cabin the garden to sew, press seams, chat or just touch the fabric a bit (yes really) ensuring that it was handled by as many caring hands as possible. For the back, 2 metres of yardage was donated by Anna at Eternal Maker, I had actually managed to miscalculate and originally requested 1.7 metres, but she correctly calculated I needed 1.9 metres – oops! 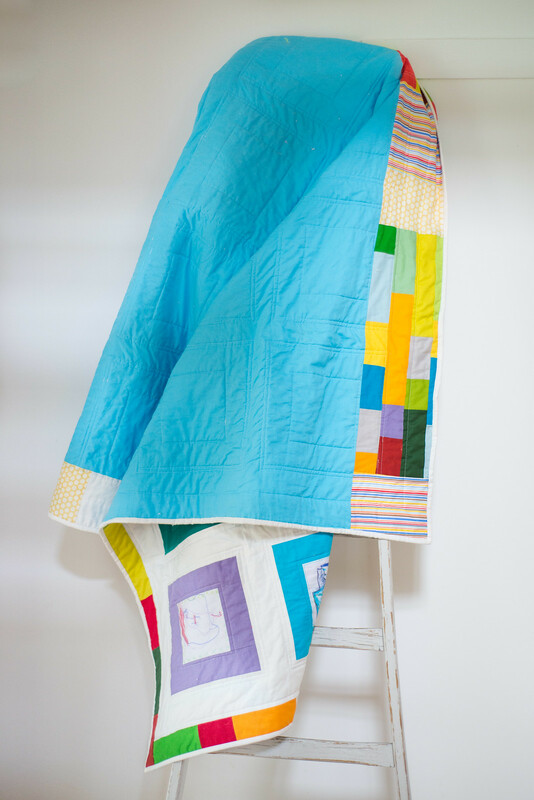 Even then when the quilt was assembled I managed to wrongly remember what width I had allowed for sashing and the quilt ended up bigger than I had originally planned so we added a patchwork border to both sides, which actually adds a really lovely additional element to the design. The final stitches of the binding were completed on Monday and it will be delivered to the little boy this week. A crowd funding page has been set up to help support the family and you can contribute (if you wish) here. That is just beautiful, his parents are going to be so overwhelmed. I’m really sorry to hear about them, so sad. Oh what a lovely way to show him how much you all care! And I’m with you all the way on the power of handmade, it carries time and love worked right into it ??? ?